It is said that Emily Griffith winks at passersby from her stained glass window outside the Old Supreme Court Chambers. Who knew the pensive lady in purple had a playful side! 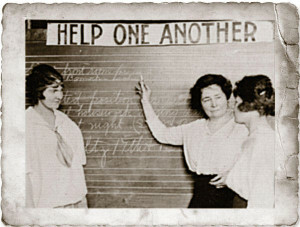 Emily Griffith made indelible contributions to education in Colorado, founded the Opportunity School in downtown Denver, and is beloved to this day for her work with adult and low-income students. In acknowledgement, Senate Resolution 16 adopted during the 1974 session and Senate Resolution 12 adopted during the 1975 session honored Emily Griffith by dedicating a stained glass window portrait of her, which hung in the Senate until 1985. 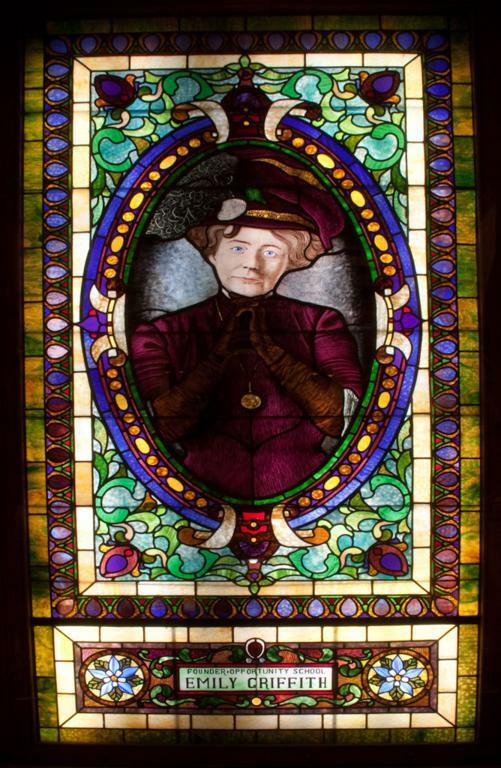 It was decided that year to honor longtime Colorado legislator Ruth Stockton with a stained glass window in the Senate. To make space for it, a group of senators chose to move the Griffith window to its current location. In 2000, Mayor Wellington Webb honored Griffith with a posthumous Millennium Award, honoring individuals and organizations that have made significant and lasting contributions to the City of Denver since its founding. Though the year of her birth is disputed*, Emily Griffith was born in Cincinnati, Ohio, the eldest of four children. By age 14, she was teaching in a sod schoolhouse in Broken Bow, Nebraska. She soon learned that many of her students’ immigrant parents could neither read nor write in English and didn’t know how to manage their money. These problems struck a chord in the young educator and led her to the idea of a school for adults with a flexible schedule and a wide variety of subjects. In 1895, the Griffith family moved to Denver, and Emily was hired by Denver Public Schools. She taught as both a substitute and full-time teacher and in 1904 became the Deputy State Superintendent of Schools, a position she held for six years. In 1915, Griffith shared her hopes for a school with Denver Post writer Frances “Pinky” Wayne, who immediately began to write about it. Within a matter of months, the Denver Board of Education gave Griffith the condemned Longfellow School at 13th and Welton streets. The Opportunity School had a home, and Griffith was there to greet 1,400 students on opening day – Sept. 9, 1916. English, typing, and telegraphy were among the free classes available in those days when the school was open five days a week, 13 hours a day. Griffith was a caring educator, giving away food and money for the streetcar and visiting sick students. The function of the school has changed to meet the needs of the public over the years. In World War I, the school trained soldiers and civilians alike. In World War II, for a time, it operated around the clock, training more than 24,000 people in defense work. These days, the renamed Emily Griffith Technical College serves 10,000 students, day and night, with programs ranging from Culinary Arts to Sheetmetal Worker Apprenticeship. The school has assisted more than 1.6 million students in reaching their educational goals since its inception. Emily Griffith retired from Denver Public Schools in 1933. Tragically, she and her invalid sister, Florence, were found shot to death at their cabin in Pinecliffe, Co., in June 1947. An associate, Fred Lundy, who committed suicide a few weeks later, has long been suspected in their murders. Still, what really happened remains a mystery. Griffith’s legacy of helping people, regardless of age, race, or education level, is honored by the 150 instructors who work at her school today. In addition to being commemorated in stained glass, Griffith is seen in the “Women’s Gold” tapestry, which honors 19 pioneering Colorado women, on the Capitol’s first floor. * “Our Colorado Immortals in Stained Glass” by Elaine Abrams Clearfield lists Griffith’s birth year as 1880, Emilygriffith.edu states she was born “in the 1860s,” and Historycolorado.org shows her birth year as 1868.